Ian King commenced his professional coaching journey in 1980. 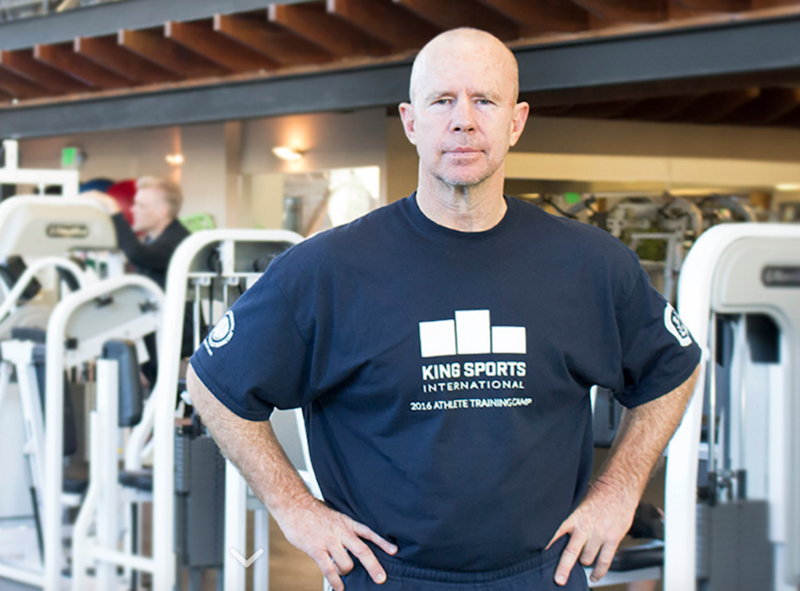 In 1986 with over 100 elite athletes in his care, formed King Sports International (KSI), the world’s first athlete preparation and coach education company exclusively servicing elite athletes, team and coaches. Since 1980, Ian has trained athletes in over 20 different countries, in over 30 different sports at the elite level, and through nine Olympic cycles. Ian has taken the lessons he has learnt during the last four decades and shared his innovations with the world through his articles, books, videos, courses and seminars. KSI has grown into a global network of coaches who share KSI’s vision of optimal athlete preparation and mission of providing athletes and coaches from all sports, all ages, all levels and all countries the opportunity to fulfill their potential in the absence of career and life-quality threatening injuries. Learn more about how KSI can help you fulfill your potential as a coach, an athlete, or as a person who physically trains for self-fulfillment, on their website! Professionally speaking, I began coaching in 1980. I went to university this year to find answers to the question, ‘what is the best way to train?’. I started out training kids in sports and the general population and very quickly attracted elite athletes. This was not my goal, however, I just wanted to train and find the answers. By 1986 I had over 100 national level athletes in my care and decided to formalize my services by registering a company. What adversity have you had to overcome as an athlete and as a coach? Wow, where do I start? As a coach, the term and role ‘strength and conditioning’ didn’t exist. Nor did the word personal trainer. I was creating a role that didn’t exist, and pioneered the way by becoming the first person (and for a while the only person) in my country who put food on the table from training athletes. When I was asked in the 1980s what I did and I answered ‘I train athletes’, the response was typically, ‘Which sport do you coach?’. The concept that I was a physical coach, and that I coached athletes in all sports, was beyond the comprehension of people. So professionally, the greatest adversity was that I had to create the opportunity and role for myself to work with individuals and teams in an era when no-one could conceive what I did and then to educate them on my professional worth! In hindsight I valued this experience. Firstly, I had to learn how to think to solve the challenge of how to physically prepare athletes in so many different sports in the absence of any literature. Those entering the profession now are spoon-fed ‘how to’ and typically miss the step of learning how to think. Secondly, there were no stereotypes about how I was supposed to train the athletes, so coaches and administrators had no preconceived idea about how I was supposed to behave and how I was supposed to train. Thirdly, there were no trends and therefore no dogma or conformity pressures about how I was ‘meant to train’ the athletes. Fourthly, the overwhelming majority of my athletes had never done physical preparation (strength & conditioning, dryland etc) training before, so they were a clean slate. I got to see what the sport alone does to a body and learnt how to reverse it. Now I get athletes whose bodies are wrecked by their physical training and have to fix that. I know this because I can compare a clean skin elite athlete from a physical training perspective to a ‘seasoned physically trainer athlete’. I preferred the clean skins. Fifthly, I was the only real go-to in my country for at least a decade so I got to process thousands of athletes, and with continuity – in many cases the full decade with the athlete groups. So I learnt the long term implications of training and had the opportunity to tweak my approach year to year to fine-tune the best way to train. These opportunities don’t really exist anymore. As an athlete there were many adversities which, using the Deepak Chopra concept of using the lessons to serve others, have had an incredible impact on the way the world trains. Firstly, I was diagnosed in my late teens with congenital early stage spina bifida, explaining the lower back pain I was dealing with. Then in my early 20’s, I was ‘tackled’ from behind by a one-ton vehicle whilst on my motor-bike, rupturing my right knee ACL along with other damage. This was in the era before arthroscopic knee surgery and ACL reconstructions, and I did a lot of damage until these options arrived. I also learnt a huge lesson following main stream ‘scientific’ guidelines of the time, initially rehabbing on an Orthotron, an isokinetic knee extension/flexion machine. What a huge price to pay! I could go on, but that’s enough about me. I prefer to focus on what I can do to help the athlete. Take my knee experience alone. Just to return to training, I had to learn how to rehab my knee. I developed a range of training strategies and exercises in the early 1980’s – suggest as wearing and recommending knee sleeves to lift in. Developing what I call control drills as pre-training exercises to selectively recruit and activate smaller muscles, such as partial range co-contractions of the knee, partial range co-contractions lunges, assisted squats. Developing a range of unilateral lower body exercises that could be effectively integrated into strength training and provide an equal if not superior result to conventional maximum loading. Such as single leg and bent leg deadlifts, single leg prone and supine hip thigh extensions, single leg back extensions and good morning. These exercises and the concepts basically form the basis of the ‘functional training movement’, not that I endorse what has become an over-reaction (the concept of human over-reaction to training methods is one I originally shared in the late 1990’s). Developing the concept of varying the speed of contraction in the eccentric and concentric phases, recognizing and varying the pause between, and creating a three digit timing system to communicate these concepts to the athlete. As an educator, the adversity continued with a lack of integrity in the industry in relation to intellectual property. Whilst most in the industry don’t seem to care where they get their information, what I have found is that the potential of my training innovations to change the way the world trains for the better and avoid injuries has under performed, in large part I believe due to the dilution of the message. As a result of this, I have recommitted to correcting the message, and enhancing it with information needed to contest the ever growing litany of injuries experienced by the world in a educational setting where the long-term interests of the individual and their health rank far lower than the personal and commercial gain of successfully promoting a training method or training device. If you though diabetes was an growing problem – and it is – you need to check out the injury epidemic that is engulfing the world that is connected to the internet. The world is heading in the wrong direction as to the way physical training is being conducted. If you endorse or benefit from surgery and sale of pain killers, you won’t be concerned. If you believe there is a better way you need to be concerned and look harder for the solutions. There is a better way, injuries are not normal or acceptable, surgery and anti-inflammatories are not the solution. Another reality for me is that adversity is always there, and our future relies upon our resilience and willing to overcome the obstacles. For example, 18 months ago I was involved in motorbike accident which left me with six fractured vertebra. There are always new challenges, new lessons and new opportunities in life! For post 45 athletes new to strength training, what key exercises should they focus on? Whilst I intend to answer the question as framed, it would be remiss of me both morally and professionally to do so without placing some clarification. I divide training up into tension producing and tension reducing, and suggest a balance of both. – say 50/50. Strength training is tension producing, and if conducted in the absence of tension reducing activity will create more problems than it solves. Yes, this is what most people do, however I advise against this. The young person will get away with it for a while, but pay the price over time. The second half of their life will pay the price faster, and their recuperation powers are less. So don’t go there. Whilst it’s politically and socially incorrect, I maintain a constant message that you need to stretch as much as you lift. In fact, the older you get, the more that ratio needs to shift towards stretching. So at worst, for every minute you engage in say, lifting (tension producing), you need to engage in a minute of tension reducing (i.e. Stretching). Now to further my currently politically incorrect agenda, dynamic stretching is not stretching. It’s what you do because it’s the current dominant trend, but is ineffectual in achieving the goal of tension reducing. And, shock horror, I also teach to stretch before you load. If you load the joint prior to opening the joint you might as well take a shotgun to the joint, ultimately. My professional job is to increase an elite athlete’s career length and in doing so typically add a minimum of a million dollars to their gross earnings. As a by-product of this zero-tolerance to injury approach, I also enhance their long term quality of life. Read ‘they get to play in the back yard with their grand-kids’. I believe you can relate to the desirability of this. So get over my politically incorrect view and experience the benefits of my guidelines by doing them. Now lets talk about strength exercise. Always do abdominal’s first in the workout. Well, most of the time for most of the people. Move from isolated exercises to compound. Forget the current dominant paradigm that all exercises needs to be compound (multi-joint) and close-chain (standing). So don’t do ‘planks’ up front. Learn how to contract your ‘corset’ muscles first, along with your trunk and hip rotators, your flexors and so on. Move from static contractions to slow speed contractions to more explosive contractions. Especially if you have joint wear or muscle strain risks. Forget about how much loading you are doing – the way you use your muscles is more important. Understand that the shape in which you load is the shape in which you adopt. So be very structurally aware of your position under load. Don’t get caught up in the current epidemic of using your spinal muscles (thoracic extensor) to get you out of all lifts, which is one of the dominant current ailments of lifting, aided by the belief that all lifts need to be total body, standing on the ground. And don’t rush to use Kettle bells or engage in Crossfit type training. No intention to offend, but these methods are not where you should start. Use your strength training to correct your posture, rather than engaging in strength training that degrades your posture. This is not the time in your life to create ill-health through your training. Rather to enhance your health. DB, barbells and your bodyweight are great options in loading, provided they don’t cause you to be overloading. Remember, loading is not king. The way you recruit your muscles is. I believe of all training modalities strength training has the greatest potential to shape your body quickly. However you are mature enough to understand that leverage goes both ways. You can rush your body into a worse shape, or into a better shape. And when I talk about shape I mean posturally, not your muscle mass or your body fat. Your posture will be more highly corrected to your muscle-skeletal health than muscle mass or body fat, and muscle-skeletal health is paramount in the second half of life! For the post 45 athletes who have plateaued, what advice would you give them to take things to the next level? Most plateaus are man made and easily overcome. Keeping it in context, there are some variables that you need to accept that the aging process is contesting you on. However, there are a number of strategies that can help you advance. Firstly, lets talk about recovery weeks. The older you get, the more frequent your recovery weeks should be. So for a young elite athlete, I typically use as 12:1 to a 16:1 ratio of training weeks to rest weeks. As you age, this could come down – to 10:1, and then 8:1, then 6 and 4:1 etc etc. In your rest week stay active, but stay out of the gym. Secondly, lets talk about progressive loading. I have developed progressive loading models that you can learn more about in my books ‘Get Buffed!’™ Even with the young athlete, I teach them how to stay away from max efforts in week one, then over a 2, 3 or 4 wk period work closer to their maximum, before repeating the cycle. The older you get, the more you need to respect this concept. Failure to do so will deny you what is call the training effect. Thirdly, you need to be changing up your program at an appropriate rate. So for every one at any stage of their training life, there is an optimal number of weeks to use and exercise for, to use the same reps for, to use the same intensity and so on. Again, I expand on these concepts in my ‘Get Buffed!’™ books. Fourthly, recovery. As you age your recovery capacity reduces. So there is an even greater need and benefit from optimizing recovery week, nutrition, nutritional supplements, sleep, stress, etc etc. Fifthly, planning. Ideally you have programs written out in advance. You can even create a load selection plan weeks in advance. If using 12 week programs, there is only four of these in a year (with 4 weeks of recovery) – so it’s not too much effort to operate off written programs. (You can see some great programs in either my ‘Book of Muscle’ or Get Buffed!™ books). An constant is observe is the longer you have been training for, the greater the potential for injury, as I believe ‘time magnifies flaws in training’. It’s one thing for a young person to disregard advice. It’s a different situation for the over 45 trainer to ignore the advice intended to save you from predictable and preventable training induced injuries. You have a large enough battle on your hands with aging – you don’t need to make the challenge greater with self-inflicted injuries! In the 1990’s I released many concepts aimed at helping you avoid pitfalls in training, including the ‘Lines of Movement’ concept which was aimed at analyzing and ensuring balance in muscle group allocation. I created categories of movements and called them horizontal and vertical push and pull (upper body) and hip and quad dominant (lower body). I trust you are using this to ensure balance at least in the exercise and muscle group selection of your strength training. Now since then new challenges have arisen, new risk for imbalances in the body. In part these new challenge have been driven by the misnomer that you need to do compound lifts on your feet – exclusively; and the advent of high fatigue (Cross-fit, boot camps etc) and high momentum, long lever activities (Kettle bell exercises etc). So we have a whole new set of challenges, however I teach strategies to prevent or overcome these newer challenges. Your challenge is to find this information, as I don’t see much focus across the industry on effective strategies to reduce your reliance on surgery, physical therapy and anti-inflammatory drugs. Remember this – the most effective and critical strategy for performance enhancement is injury prevention – for elite athletes, general population, and all ages alike! What is your one injury prevention tip? You may have noticed that injury prevention is a massive focus for me, and I have written volumes on the subject. I have dedicated decades to ensuring athletes have a long and fruitful career and post sport life, and you can apply these same strategies to your benefit. Rather than going through a long list of strategies, I want to focus on one simple concept – do not assume that what you are doing is creating long term musclo-skeletal health just because you have got away with it to date. There is no such thing as the ‘perfect training method. All training has upsides and downsides, and the key is knowing what that is, and balancing it by reversing and alternating the training to counter the downsides. I called this principle ‘The opposite and equal effect’. Strength training is a very powerful stimulus, and has the ability to shape you for better or worse faster than any other training method. You can create a real mess very quickly. I would like to think that the professional standards would be higher, and that this higher standard would need to be met before a ‘professional’ was handed the keys to implement training methods that could and will change you forever. But this is not the case. Much of your influence to date has been from sources that did not have the competence or experience to guide. Therefore, I believe it is critical to empty your cup, to review your entire approach to training. Be objective, disregard trends, dogma and conformity pressure. Ask yourself ‘What is best for me at this stage of my life?’ You may be stunned at the answers. Rarely will it be what the majority are doing! To use an example, take stretching. The world has moved away from the basic application that was globally apparent in the 1980s, when during thee 1990s a new trend commenced that disparaged the value of stretching. This trend, as popular as it seems, has been one of the greatest contributors to injuries in sport and training in the last few decades. You don’t want to participate in this trend! Stretching should be your best friend! I often talk about individual elite athletes such as Novak Djokovic, Kevin Durant and Tom Brady to name a few. Novak stretches in ways that the world just doesn’t want to recognize, and lives the benefit of this in performance and injury prevention. Kevin Durant disregarded the dominant value that you need to lift heavy and be buffed to play NBA, and is a walking and outspoken exponent of this reality. Tom Brady’s five Super Bowl rings are testament to his realization that keeping lose and avoiding training and nutrition that would stiffen him up and slow him down were to be avoided. They have spurned the mass thinking and received massive rewards for doing so–you can too! What supplements provide the most bang for your buck for the post 45 athletes looking to maximize their performance in the gym? Great question, and before I answer this, understand that supplements are just part of the equation. Your food, your sleep, your stress levels, your active recovery training and so on – don’t forget this! Now to answer the question! The absolute number one supplement you should be using is a high potency high quality multi-vitamin/mineral. High potency means forget products aimed at appeasing the outdated Recommended Dietary Allowances/Intake (RDA or RDI). They served our ancestors travelling over from Europe a few hundred years ago, but scurvy etc. is no longer a challenge per se! We’ve gone further than that. Look for a brand that focuses on optimal does, not minimum dose! Now for high quality. Understand that the nutritional supplement industry is relatively unregulated. You have no idea how the manufacturing process occurred for the most part, and you have no idea whether what’s on the label is in the bottle. I recommend you check out Canadian author Lyle MacWilliams book ‘Comparative Guide to Nutritional Supplements’ for further guidance. From here, it really comes down to your individual needs. If joint protection is paramount, look for a high quality glucosamine product. If you cannot feel the difference from taking this phenomenal product you may not be using a high quality product. If heart protection is paramount, look for a high quality CQ10 product. If you can’t feel the energy lift from this (as a byproduct benefit), you may want to look for a different brand. Another product to consider is a fish oil, with many different potential benefits from connective and circulatory tissue health to contribution to fat loss. Your challenge is wading through the marketing of the ‘latest breakthrough products’. I recommend you base your nutritional supplement program on foundational micronutrients. For the most part, this is far more beneficial than chasing the latest ‘performance’ supplements. In summary don’t look to do what the masses are doing. Look for the things that serve you. They are rarely one and the same! This is an outstanding interview. I am pleased that Ian could take the time to speak with you and further enlighten your readers. I recall reading Ian King’s training articles in the late 1990s and early 2000s and quickly discerned that this bloke knows his stuff. Having previously read extensively on weight training and having responded highly to my own training techniques over numerous years I thought I had a great working knowledge in this area. After I bought Ian’s his Get Buffed! book I soon realized that I was too myopic and that I understood just a small fraction of stuff that was actually worth knowing. If I had my time again I would spend at least as much time stretching (and beforehand) as I did lifting weights. I am quick to pass this advice to the younger generations whenever they ask me about matters relating to training. Thanks again for publishing this interview.